In my book The Negotiations that never were, I mentioned the encounter between Deng Xiaoping, China's new Paramount Leader and Gyalo Thondup, the Dalai Lama's elder brother in March 1979. Excerpts of the book are posted below. We have now another side of the coin. The US Department of State has recently released Volume XIII of the Foreign Relations of the United States (Carter Administration - 1977-80). One discussion is however worth citing. It took place during Walter Mondale, the US Vice-President's visit to China in August 1979. On August 27, 1979, Mondale met Deng Xiaoping (then China's Vice-Premier of the State Council). Mondale was accompanied by Leonard Woodcock, U.S. Ambassador to China; David Aaron, Deputy Assistant to the President for National Security Affairs; Richard Holbrooke, Assistant Secretary of State for East Asian and Pacific Affairs and Denis Clift, Assistant to the Vice President for National Security Affairs while Deng Xiaoping had Huang Hua, Minister of Foreign Affairs, Zhang Wenchin, Vice Minister of Foreign Affairs and Chai Zemin, China's Ambassador to the US, on his side. During the course of the conversation Deng broached the topic of Dalai Lama. As for the matter of the Dalai Lama, that is a small matter. We made clear our position. It is not a very important question because the Dalai Lama is an insignificant character. Vice Premier Deng: If he wants to come back, he could still live in that house. Of course, it is an illusion on his part. The idea of wanting to have a state of Tibet. Not long ago he visited the Soviet Union, and we have confirmed information that he went there on orders of the Indian Government. Some of his important officials [the first fact-finding delegation] have recently come back and have gone to Tibet to see officials and conditions there. Concerning the Dalai Lama’s visit to the United States, he was received only as a religious leader and not as a political leader. He will not be treated as a political leader. And our position, whenever asked, is that Tibet is part of China. Deng's remark raises a serious question, was the Chinese leader sincere when, a few month earlier, he told Gyalo Thondup: “The door is opened for negotiations as long as we don’t speak about independence. Everything else is negotiable”. 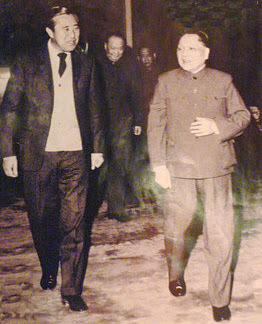 In November 1978, Gyalo Thondup met with Li Ju-sheng who was designated as ‘Xinhua Director No. 2’ in Hong Kong. They had several encounters which lasted 5 or 6 weeks. Li certainly relayed his conversations to the leadership in Beijing. It seems that the objective from the Chinese side was to build confidence to prepare an eventual visit of Thondup to China where he would meet officials. At the beginning, Gyalo Thondup did not know that Li Ju-sheng was close to Deng Xiaoping (who was acquainted with his intelligence work in Indonesia in the 1960s). Deng had personally sent Li to Hong Kong and given him this designation (Director No 2) . After a few meetings, Li recommended to Deng that Thondup be invited to discuss the situation in Tibet. The arrival of the [Tibetan] New Year brought no let-up in this spate of extraordinary developments. On 1 February 1979, coincidentally the day that the People's Republic of China was formally recognised by the US, the Panchen Lama, in his first public appearance for fourteen years, added his voice to those calling for the Dalai Lama and his fellow exiles to return. 'If the Dalai Lama is genuinely interested in the happiness and welfare of the Tibetan masses, he need have no doubts about it, he said. I can guarantee that the present standard of living of the Tibetan people in Tibet is many times better than that of the old society’ . 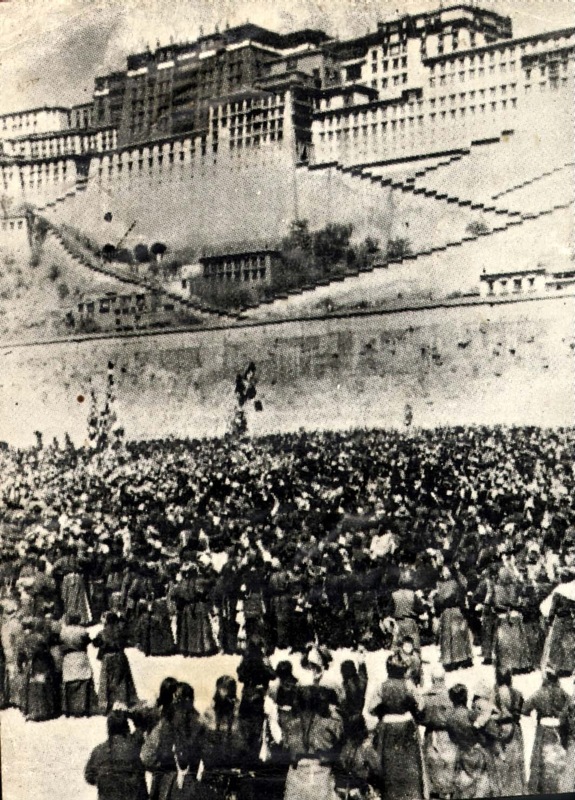 A week later, this invitation was repeated by Radio Lhasa. The nomination of a special welcoming committee to receive Tibetans from abroad was announced. This was followed just a week later by the unexpected arrival of Gyalo Thondup in Kanpur (Uttar Pradesh) where I was attending a religious conference. To my surprise, he announced that he had heard through some old and trusted friends of his in Hong Kong (where he now lives) that Xinhua, the New China News Agency, which constitutes China's official legation to the British colony, wanted to make contact with him. Following this, he had met a personal emissary of Deng Xiaoping, who explained that the Chinese leader wanted to open communications with the Dalai Lama. As a mark of his goodwill, Deng wanted to invite Gyalo Thondup to Peking for talks. My brother had refused as he wanted to seek my opinion first. This was totally unexpected, and I did not reply immediately. The developments of the past two years all looked very promising However, as the ancient Indian saying goes, 'When you have once been bitten by a snake, you become cautious even of a rope.' And unfortunately, all my experience of the Chinese leadership suggested that it was untrustworthy. Not only did the authorities in question lie, but worse, when these lies were exposed they were not the least bit ashamed. The Cultural Revolution had been a 'tremendous success' whilst it was going on; now it was a failure — but there was no sense of humility in this admission. Nor was there anything to suggest that these people ever kept their promises. Despite the concrete undertaking of clause thirteen of the Seventeen-Point Agreement that the Chinese would 'not arbitrarily take a needle or thread' from the Tibetans, they had ransacked the whole country. On top of this, through countless atrocities, they had shown a total disrespect for human rights. It seemed that to the Chinese mind, perhaps because of the huge size of their own population, human life is considered to be a cheap commodity — and Tibetan lives to be of still less value. I therefore felt it necessary to exercise extreme caution. On the other hand, my basic belief is that human problems can only be solved through human contact. So there could be no harm in hearing what the Chinese had to say. Hopefully we could simultaneously explain our own views. We certainly had nothing to hide. Also, if the authorities in Peking were in earnest, we might even be able to send some fact-finding missions to discover for ourselves the real situation. With these considerations in mind, and knowing that our cause was 100 per cent just and in accordance with the wishes of the entire population of Tibet, I told my brother he was free to go. After he had seen the Chinese leaders, we would consider the next step . The road was cleared for the first direct contacts between the Dalai Lama’s brother and the new leadership in Beijing. The meeting between the supreme leader of the People’s Republic of China and the Dalai Lama’s brother took place in Beijing on March 12, 1979. Immediately, Deng blamed the Gang of Four for the difficult situation in Tibet. It was then the standard excuse for all that had gone wrong in China (and in Tibet) since the mid-sixties. But Deng said that he was keen to improve the lot of the Tibetan population. He told Thondup that he would like to invite the refugees in India and abroad to return to Tibet, “It is better to see once than to hear a hundred times”. It was during this encounter with Gyalo Thondup that Deng Xiaoping said: “The door is opened for negotiations as long as we don’t speak about independence. Everything else is negotiable”. Around that time, the Dalai Lama proposed to Beijing (via the Chinese Embassy in India) that a fact-finding mission from Dharamsala should be permitted to visit Tibet with a view to discovering the real situation there and reporting. Gyalo Thondup had been requested to work out the details. It was a transcript of the meeting between Indian Prime Minister Jawaharlal Nehru and the Dalai Lama, who a few weeks earlier had taken refuge in India. The Tibetan leader was then staying in Mussorie (Uttarakhand). Today, I am posting two letters written by the Dalai Lama to Nehru during the former's early days in India. They can be found in Selected Works of Jawaharlal Nehru (Part II - Volume 49, May 1 - June 30, 1959) published by the Jawaharlal Nehru Memorial Fund. The communists should stop their diabolical activities in Tibet which has resulted in enormous bloodshed from a fixed date and should also immediately set free all the Tibetans who are either imprisoned or set to heavy manual task. 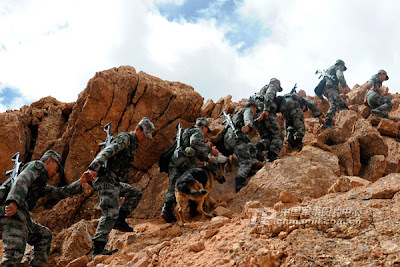 The entire Chinese military force should be withdrawn from Tibet and not a single soldier be left behind. An enquiry should be made whether damage has been caused to Buddhism in Tibet, its institutions including precious scripts and idols, congregation of monks and the means of Tibetan people's livelihood, etc. A committee representing the countries having common boundaries with Tibet under the leadership of India with representatives of some neighbouring Buddhist countries accompanied by some of our Tibetan officials should be sent to all parts of Tibet equipped with wireless transmitting sets in order to make a thorough enquiry and ensure that the two points mentioned above are properly observed. In order to give medical aid and assistance to the wounded persons and patients of Tibet and to prevent the outbreak of epidemic and famine as a result of the present sanguinary clash, the International Red Cross should be permitted to open a branch in Tibet to serve all parts of Tibet. May these requests meet with Your Excellency's favourab1e consideration and sympathetic help so that these may find realisation. The Chinese were certainly not ready to accept these conditions, and Nehru was not in the mood to even ask his friend Zhou Enlai to institute an enquiry or request him to move the Peoples' Liberation Army out of Tibet. Here is the second letter, 6 weeks later. The Government of India have been kind enough to give every possible help to the Tibetan refugees and I have expressed my heartfelt thanks recently through Shri [K.L.] Mehta and Shri P.N. Menon. I am thanking the Government of India once again for the kindness. But, I could not help giving you the following trouble and hope that you will not mind. Younger members of the Tibetan refugees, during their stay in India, may kindly be given education and other possible training by the Government as soon as possible. If they are favoured with this opportunity, it will not only be helpful to them, but it will be of great help to the Government of Tibet in future. As discussed during our recent meeting, I am thinking of sending some of my representatives to the Eastern and Western countries in order to establish religious links. Lists of the names of the representatives will be sent to you later. It is requested the Government of India may be kind enough to give them facilities such as the grant of passports to visit foreign countries and also permission to return to India on completion of their work, and foreign exchange to meet their required expenses. I am thinking of removing the gold and silver bullion that I have deposited in Gangtok to Calcutta for sale. Permission may please be granted to do so and also customs duty on them may kindly be exempted. In order to maintain my Government and staff, for a period of one year, I may kindly be granted a loan of Rs. 47,36,000.00 (forty-seven lakhs and thirty-six thousand only). I wish to send some young Tibetans to have foreign education. If this proposal comes through, I will submit their names and hope they will be granted passports to go to foreign countries. They may also be permitted re-entry into India on completion of their education. It is clear that education of the younger generation of refugees was foremost in the Dalai Lama's mind in the early days. My article A New Chinese Aggression has been posted in NitiCentral. China has done it again. One would have thought that after the 4 day- Plenum of the 18th CPC Central Committee (held from November 9 to 12) that the new leadership would have began focusing their energies on reforms; but no, they have taken a most controversial and dangerous course, destabilizing the region and upsetting the neighbours. In India, we still remember the events of April, when the People’s Liberation Army planted their tents in Depsang Plain of Ladakh. 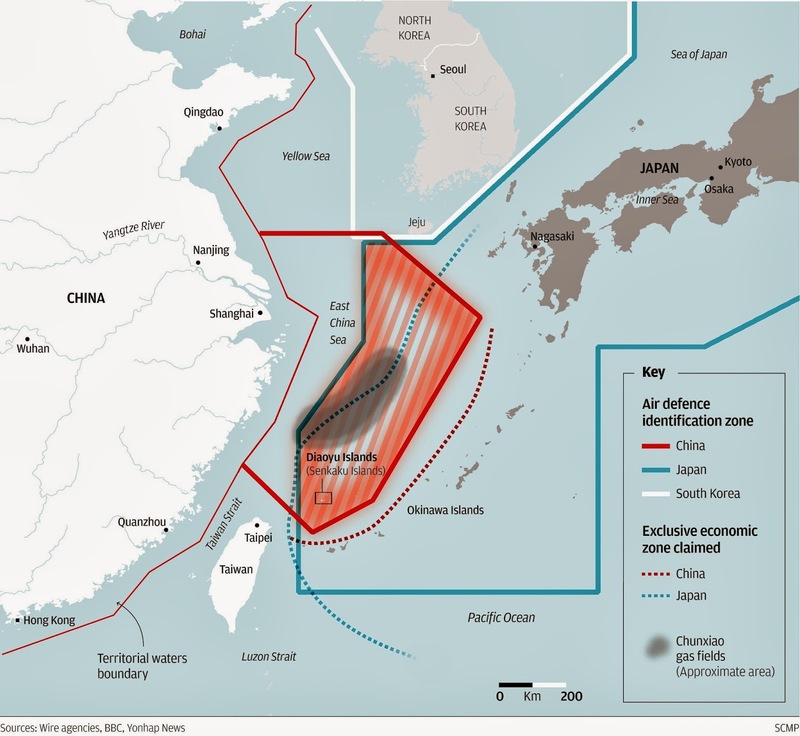 On November 23, the Chinese Ministry of National Defense issued a statement announcing the establishment of the East China Sea Air Defense Identification Zone, “in accordance with the Law of the People's Republic of China on National Defense (1997), the Law of the People's Republic of China on Civil Aviation (1995) and the Basic Rules on Flight of the People's Republic of China (2001).” Well, not accordance with friendly relations with its neighbours! The statement then gives the coordinates of “outer limit of China's territorial sea”, which engulfs the South China Sea and the islands in dispute with Japan. A few days earlier, the Third Plenum had delivered 2 new Leading Groups: one on reforms (it was expected) and more surprisingly, a National Security Committee (NSC). A host of measures were initiated ‘to ensure that the authority of the constitution and laws is upheld’. Beijing admitted that the most important factor which needed to be monitored is what the Party calls ‘stability’. According to Xi Jinping, the new economic policies can only be implemented if China is stable: "State security and social stability are preconditions for reform and development", said the President, adding that only when the nation is safe and society is stable, could reform and development constantly advance. Will the new aggressive foreign policy make China stable? Certainly not! Does the latest move, to create Air Defense Identification Zone have been taken with a ‘single voice’? We have to wait several decades to know. It was also said that the PLA will “better co-ordinate the work of its different military and geographical branches”. The Plenum also decided to optimize the PLA’s size and structure and also adjust and improve the proportion between various troops, and reduce non-combat institutions and personnel. In the process, there is an increase of aggressiveness; recently, the Chinese military's National Defense University, the General Political Security and General Staff Departments, the Chinese Academy of Social Science and the China Institutes of Contemporary International Relations jointly released a documentary titled ‘Silent Contest’; though widely circulated from June to October, it was later blocked by the authorities. The movie, which is pure anti-American propaganda, asserts that the United States has used 5 methods to subvert China: 1) Political Infiltration, 2) Cultural infiltration, 3) Ideological infiltration, 4) Organizational infiltration, and 5) Political interference and social penetration. Washington’s ‘conspiracy’ is said to be at the root of all evils in the Middle Kingdom: social conflicts, officials' corruption, human rights protests, spread of Christianity and advocacy of a ‘constitutional government’. Is the latest move an indirect attack on the US? Fumio Kishida, Japan’s foreign minister immediately condemned the new China’s air defense zone over disputed islands. He said that the Chinese declaration is a dangerous escalation that could lead to a miscalculation or accident; this, in turn, could start an armed confrontation and the US would automatically be dragged into the conflict. The US Defense Secretary Chuck Hagel warned that the American government viewed the Chinese move “as a destabilizing attempt to alter the status quo in the region.” He also reaffirmed that the United States would stand by its security treaty obligations with Japan. White House spokesman Josh Earnest told reporters that the fact that China wants airlines to inform Beijing when they are entering airspace over disputed islands in the East China Sea is ‘unnecessarily inflammatory,’ adding that there should be common ground “to reach a resolution that doesn't involve inflammatory, escalating rhetoric or policy pronouncements by any side, and that's how we hope this situation will be resolved." It is however not in China’s habit to back out of its position. While the new NSC is supposedly designed to increase the coordination and the integration between the police, military, intelligence and diplomatic services; it is doubtful if the diplomatic angle has not been taken into consideration in this case. My article The Metok bombshell appeared today in The Statesman. The PLA will be the first beneficiary. It is good that Delhi has finally decided to raise a mountain 'strike' corps with some 80,000 troops to be posted along the Line of Actual Control (LAC) with China. The new formation, the 17 Corps, along with its infrastructure will hopefully be operational in the next seven years, but the roads to the border have also to be taken up on a war-footing, otherwise the new Corps may not be able to even reach the LAC ~ CLAUDE ARPI. The Chinese are masters at timely announcements. 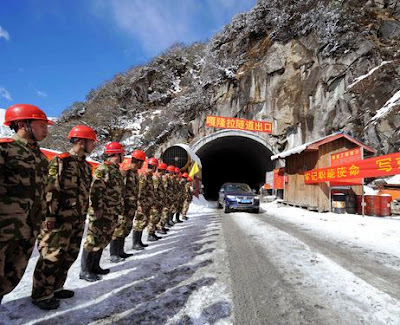 When the then Chinese Premier, Wen Jiabao, was landing in Delhi in December 2010, Xinhua dropped a bombshell: “The tunnel of highway linking Tibet’s Metok completed”. Considering that Chinese engineers and contractors are always several times faster than their Indian counterparts to build roads (or dig tunnels), the enormity of the project was obvious; construction workers had taken some two years to complete the construction of the 3,310-meter Galongla tunnel, built at an altitude of 3,750 meters. It was the most difficult section of the highway which was to link Metok County to the mainland (and allow troops to come close to the Indian border in a much shorter time). At that time, some 90 km of highway remained to be built. Metok was indeed symbolic. 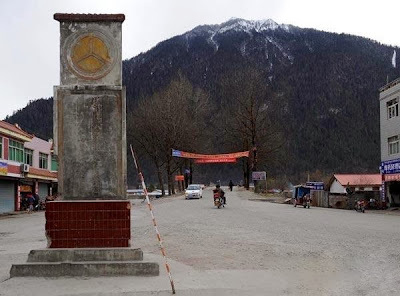 With a population of just 11,000, it was not only China’s last county to have a highway, but the road was a crucial link to the area bordering the Upper Siang district of Arunachal Pradesh. For the Tibetans, it has remained till this day one of the most pristine regions of their country; they consider the area around the Great Bend of the Yarlung Tsangpo river (Siang in Arunachal and Brahmaputra in Assam) as the home of the Goddess Dorjee Pagmo, Tibet’s Protecting Deity. Many believe that this place, locally known as Pemakoe, is the sacred realm often referred to in their scriptures, the last hidden Shangrila. It is said that the great Indian tantric master, Padmasambhava (known as Guru Rinpoche by the Tibetans), and his consort Yeshe Tsogyal visited the place during the 8th century. The Guru tamed the local spirits and concealed spiritual scriptures or treasures (known as termas) for future generations. Pemakoe is located at an altitude ranging from 2000 to 3500 m. above sea level, south of Kongpo and Powo (Kham) and north of Arunachal Pradesh (Geling-Tuting area of Upper Siang). It is surrounded by high mountains (dominated by Mt. Namcha Barwa, at an altitude of 7,782 m) and covered by lush vegetation. 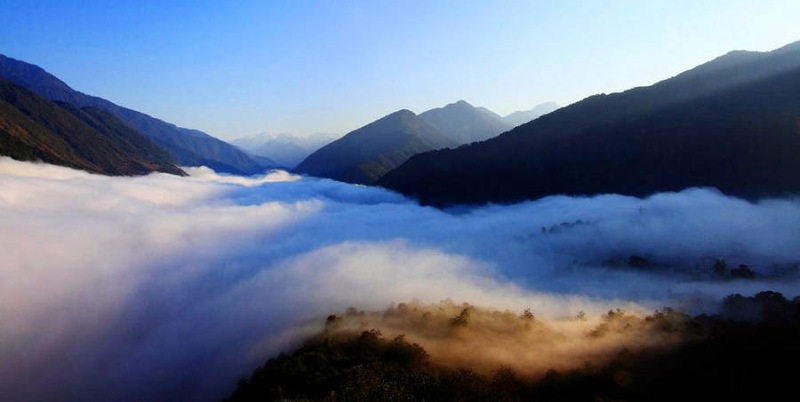 The rare species of flora and fauna within the canyon is not yet well documented, though the Chinese authorities admit that the region is home for more than 60 per cent of the biological resources on the Tibetan Plateau. The Pemakoe area and Metok will not be an isolated paradise anymore. When the Bomi-Medok road joins the National Highway No. 318 near Zhamog township, it has already crossed six rivers. Again, an attempt was made in 1974 and it failed. In 1980, a landslide occurred 106 km away from the starting point; most of the newly-built road was devastated and many trucks and road-building equipment could not be rescued. The project was again abandoned. It re-started in 1990 and though in February1994, a katcha road had been completed and vehicles managed to enter Metok, they never came back because of disastrous landslides and mudslides. A monument has even been built to commemorate China’s ‘shortest life’ road. The latest attempt, and the first to be successful, is the fifth one. The Chinese media now affirms: “The opening of the highway to Metok is far more than a technological breakthrough …Above all, it is the Chinese dream fulfilled after several failed attempts over the past fifty years. 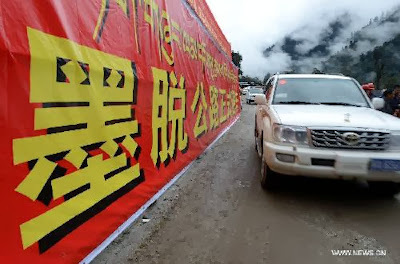 The opening of the highway is bound to boost the socio-economic development of Metok,” and also, one should add, … the People’s Liberation Army’s defence preparedness. Pang Kuo, the director of the Sichuan-Tibet Military Service Station Department, told the Xinhua reporter: “It used to take the ‘hinny fleet’ more than two months to provide the yearly ration of staple and non-staple food for officers and men posted in Metok. Now it takes only one trip of the motorcade to supply enough materials the troops need for a whole winter”. Xinhua may poetically say that “without doubt the Metok road is the road of wealth, the road of hope and the road of happiness. Local people will experience unprecedented convenience in their daily life; the culture, tourism and agriculture of Metok are bound to thrive due to this road” and that the highway “embodies the Chinese dream for the benefit of its people and reflects the mutual aspirations of all ethnic groups”. But the fact remains that the PLA will be the first beneficiary. It is good that Delhi has finally decided to raise a mountain ‘strike’ corps with two independent infantry brigades, two armoured brigades, with some 80,000 troops to be posted along the Line of Actual Control (LAC) with China. The new formation, the 17 Corps, along with its infrastructure will hopefully be operational in the next seven years, but the roads to the border have also to be taken up on a war-footing, otherwise the new Corps may not be able to even reach the LAC. After holding a 4 day-conclave from November 9 to 12, the Third Plenum of the 18th CPC Central Committee has delivered 2 new Leading Groups: one on reforms (it was expected) and more surprisingly, a National Security Committee (NSC). Economic reforms are fine, but Xi Jinping and his colleagues have understood that there is a more serious danger looming in the Middle Kingdom’s sky: the Emperors have to act fast to avoid the doom of the former Soviet Union (where the internal security apparatus had become weak, corrupt and ineffective). If effective reforms are not introduced at once, the days of the Communist Party are counted. Amongst the sectors to be reformed, the 204-member Central Committee discussed building a more impartial and sustainable social security system; encompassing an improved housing guarantee; strengthening the protection of intellectual property rights; encouraging innovation, etc. It further decided to allow more non-state-owned capital into the market to develop a ‘mixed-ownership economy’; to accelerate the reform of the ‘hukou’ system (household registration) in order to help farmers become urban residents and to promote market-oriented reform in state-owned enterprises by breaking monopolies and introducing competition. Though the decision to move forward can be considered a positive step, the implementation of the reforms won’t be easy. A host of other measures have been taken ‘to ensure that the authority of the constitution and laws is upheld’. Only the future (the 9 coming years) will tell us if the Communist system is reformable, or if it is condemned to follow the Soviet Union’s model. But there is a more important factor which needs to be monitored by Beijing; it is called ‘stability’ in Communist jargon. According to Xi Jinping, the new economic policies can only be implemented if China is stable: "State security and social stability are preconditions for reform and development", said the President, adding that only when the nation is safe and society is stable, could reform and development constantly advance. Tibet and Xinjiang are two of the ‘internal’ threats which will be dealt with by the new body. Recently, the repression has increased in both restive regions. The self-immolations in Tibet have been the most visible consequence of the stiffening of the security apparatus. While actively popularizing the Internet, the Plenum decided to ‘reinforce its overall administration over cyberspace in accordance with the law and accelerate formation of a sound Internet management system”. Isn’t it ominous? Though analysts believe that the NSC is based on the National Security Council of the United States, it will have snooping facilities like the infamous National Security Agency of the US. Reuters says that the NSC “would increase coordination among the various wings of China's security bureaucracy, split now among the police, military, intelligence and diplomatic services”. Importantly for India and other China’s neighbours, the People's Liberation Army (PLA) will also be ‘reformed’. In the wake of the Plenum, military schools will have to review their curriculums ‘to boost real combat abilities’, as a PLA publication put it. The military academies and universities should thereafter “foster talent in accordance with the goals of strengthening the army and boosting students' ideological and political quality, adopting a combat-oriented educational system”, adding “concrete efforts should be made to cultivate high-quality military talents that are capable of participating in and winning a war." The new NSC will overview and monitor these ‘reform’ programs. It is also said that the PLA should “better co-ordinate the work of its different military and geographical branches”. Does it mean that the Central Military Commission will change the army's command structure to enhance its capacity to ‘win modern wars’? The South China Morning Post quoted military officials and experts saying that the PLA was keen on innovation, but was unlikely to build a chain of united commands like the US Pacific Command, which co-ordinates regional military, terrorism and crime-fighting. The leadership can’t go too fast with the vested interests in the PLA. The Central Committee further called for “innovation in military theory, strengthening military leadership, improving military strategy in the new era, and building a modern military power system with Chinese characteristics.” All this means a centralization of the power of the Central Military Commission (CMC) whose role will be ‘optimized’. Interestingly, ‘quality privately-owned enterprises will be allowed to join defence industry’. Can India study these reforms and learn from them? Another question is, will China defend more aggressive postures? Recently, the Chinese military's National Defense University, the General Political Security and General Staff Departments, the Chinese Academy of Social Science and the China Institutes of Contemporary International Relations jointly released a documentary titled ‘Silent Contest’; though widely circulated from June to October, it was later blocked by the authorities. This type of propaganda does not fit with the oft-repeated Peaceful Rise of China’s theory. In the months to come, Beijing will have to choose between its aggressive attitude towards its neighbours (and the US) or the continuation of its peaceful growth. Will the new Emperors understand this? We shall have to wait some time to know. 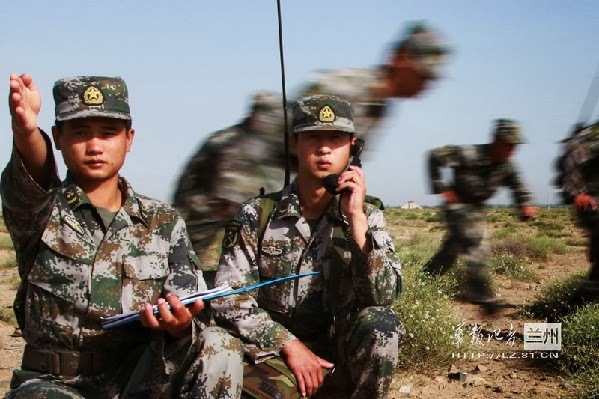 In the meantime Delhi should definitely be alert as the NSC will also be responsible for the Sino-Indian border issue and incidents similar to the Depsang Plain episode in Ladakh in April could occur again and this time, there will be no ‘lack of coordination’ on the Chinese side. The Digital Archives of the Cold War International History Project of the Wilson Center in the United States has added few new fascinating historical documents to their rich collection. Three of them are related to Tibet. The first one is a short 'marginal note/directive' from Chairman Mao. It is written onto a 'situation report' [qingkuang jianbao] about Tibet and it is dated February 18, 1959, just 4 weeks before the uprising of the Tibetan people in Lhasa (Match 10, 1959). The note (and report) sent to Liu [Shaoqi], Zhou [Enlai], Chen Yi, [Deng] Xiaoping, mentions: "After reading return to Comrade [Marshal] Peng Dehuai." Twelve days after the Dalai Lama left at night the Norbulinka Palace to take refuge in India, Mao put up another marginal note. It is a comment on a report about the Indian Foreign Ministry's spokesman stating on 29 March 1959 that Tibetans in India had not undertaken 'illegal activities'. Dear Indian friends: Don’t be credulous with the Tibetans. Their direction of the Tibet uprising is secret. Maybe we know what you don’t know! (Editor's note) Mao’s tone seems to imply that he suspects the Indians of feigning ignorance. The third document is a report from Yuri Andropov, who had been posted as Soviet Union's Ambassador in Hungary during the 1956 tragic events. In 1957, Andropov returned to Moscow from Budapest in order to head the Department for Liaison with Communist and Workers' Parties in Socialist Countries. Later he became the KGB boss, and from 1982 to 1984, he was General Secretary of the Communist Party of the Soviet Union. It is interesting to note that 'Chinese friends’ are concerned about Communist China relations with India after the Tibet's events: "Since Indian circles were mixed up in the Tibetan events, it will effect Chinese-Indian relations in some measure." The Soviet report mentions the reactionary parties such as the Indian Popular-Socialist Party which organized several 'anti-Chinese' meetings and demonstrations. It refers to George Fernandes' Party activities. The report further points out that many Indian newspapers have begun an anti-Chinese campaign. The Soviet Union will later condemned China rather mildly. In a report dated December 18, 1959 for CC CPSU [Central Committee of the Communist Party of Soviet Union] Plenum, Suslov wrote: "During this spring relations between the People's Republic of China and India have seriously deteriorated. This deterioration is linked to the counterrevolutionary rebellion in Tibet in March 1959. Reactionary circles of India to some extent were probably involved in this rebellion. However, the rebellion in Tibet would not have taken place, had one implemented timely democratic reforms and appropriate measures to improve economy and culture with a view on historical specifics of Tibet, and had one been duly vigilant with regard to reactionary elements. Unfortunately, Chinese comrades also did not draw appropriate conclusions from the warnings of the CC CPSU about the activities of reactionaries aimed at the forceful separation of Tibet from the People's Republic of China." My website has a large collection of historical documents related to the 1959 events. The discussion between Mao and Khrushchev is also worth reading. 'On the situation in Tibet' was prepared on the basis of information provided by the Chinese friends on the latest events [in Lhasa] and [using] other materials available to the [International] Department of the CC CPSU. Head of CC CPSU Department of ties with communist and worker parties in socialist countries. Tibet is one of the largest territories of the border provinces of China, occupying more than 1.2 million square kilometers. According to the 1953 census, the Tibetan population in the PRC numbers 2.775 million. In Tibet itself, however, less than half is concentrated (1.27 million). The remainder live in the areas of the PRC next to Tibet and are autonomous (autonomous districts and provinces in Qinghai, Sichuan, and others). In the past Tibet was long the object of English and then American influence. The Indian bourgeoisie also had significant interests in Tibet. Tibet’s leadership cultivated ties with these countries and came up with the idea of creating an “independent Tibet.” When the Guomindang regime fell in 1949, the Tibetan ruling circles tried to realize the idea of Tibetan independence. They asked all governments for help “in the struggle for independence,” drove out the Guomindang men, refused the peaceful suggestions of the PRC and prepared for military action against China. In 1951 PRC troops entered Tibet and these leaders had to end their resistance. Officially, Tibet was liberated peacefully on the basis of an agreement concluded in Beijing in May 1951 between the PRC central government and the Tibetan local government. The Tibetan delegation to the negotiations was headed by Ngabo Ngawang Jigme, who had previously handed over Eastern Tibet to the PRC troops. The Panchen Lama also took part in the negotiations. He had established contact earlier with the Chinese friends and was interested in returning from exile to Tibet to recoup his position as second only to the Dalai Lama. carrying out of one or another reform would be agreed upon [in advance] with the Tibetan authorities. Measures for helping Tibet to develop its economy and culture were also planned. Although in recent years the PRC government has carried out several measures to raise its economy and culture, Tibet remains, even today, one of the most backward provinces of China. 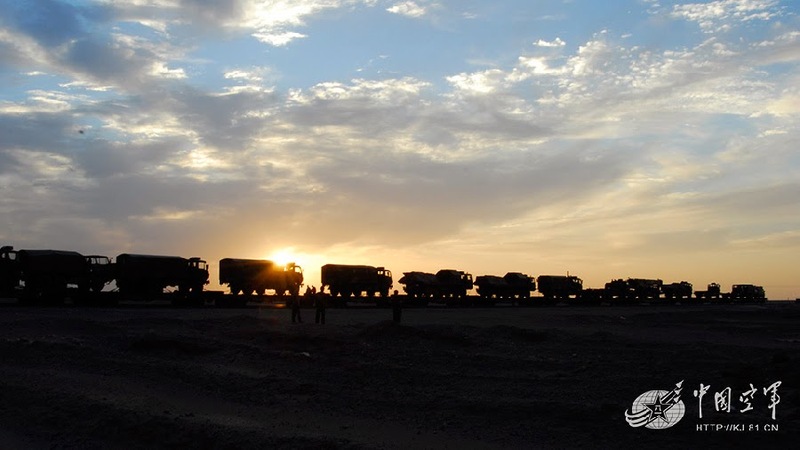 Some of the most important enterprises are the completion of major highways: Xikang- Tibet (length 2255 km), Qinghai- Tibet (2100 km) and Xinjiang-Tibet (under construction). Local industrial enterprises, several state farms, and experimental agricultural stations have been established. Much has been accomplished in providing the population of Tibet with goods and food. Previously, there were no lay schools in Tibet. Now there are over 60 schools, including one middle school in Lhasa. Much has also been done in public health, including the training of some Tibetans. Despite some successes achieved by the Chinese comrades, the political situation in Tibet remained complicated. There were periodic disturbances. Major unrest occurred in 1954-56. In 1955, the CC CCP sent Deputy Premier and Politburo member Chen Yi to Tibet. To calm things down a part of the Chinese organization and troops were withdrawn from Tibet. The region of Chamdo, populated by Tibetans, was joined to Tibet. The military-administrative committee was reorganized into a preparatory committee for the creation of the Tibetan Autonomous Region, with the Dalai Lama at its head. The Dalai Lama and his reactionary retinue continually prevented democratic transformation. Because of this, in Tibet neither land nor other democratic reforms have been carried out. Land remains in the hands of the monasteries, lay and spiritual feudals [feodaly]. In the socio-political realm, the feudal-serf order under the rule of religion, monasteries, and lamas remains almost untouched. There are over 100,000 lamas in Tibet cons tituting the basic reactionary force actively supporting the Dalai Lama. Even now there are no elective organs of popular power in Tibet. In this respect the PRC Constitution has not yet been extended to Tibet. In his 1957 speech “On the question of the correct solution of contradictions within the people,” Com. Mao Zedong pointed out that conditions for democratic changes in Tibet were not yet ripe, and therefore they would not be carried out in the Second Five-Year Plan (1958-62). In Mao’s words, the Tibetans themselves would decide on carrying them out in the Third Five-Year Plan. The Communist Party of China has made the realization of Tibetan autonomy depend on the general political situation in that province, the carrying out of democratic transformations and the preparation of new cadres capable of carrying out the party’s policy. The joining to Tibet of other areas of the PRC with Tibetan populations also depends on this. The Chinese comrades try to lead a careful policy in Tibet in order to avoid unnecessary complications. Despite these efforts, however, the situation in Tibet recently became more strained. 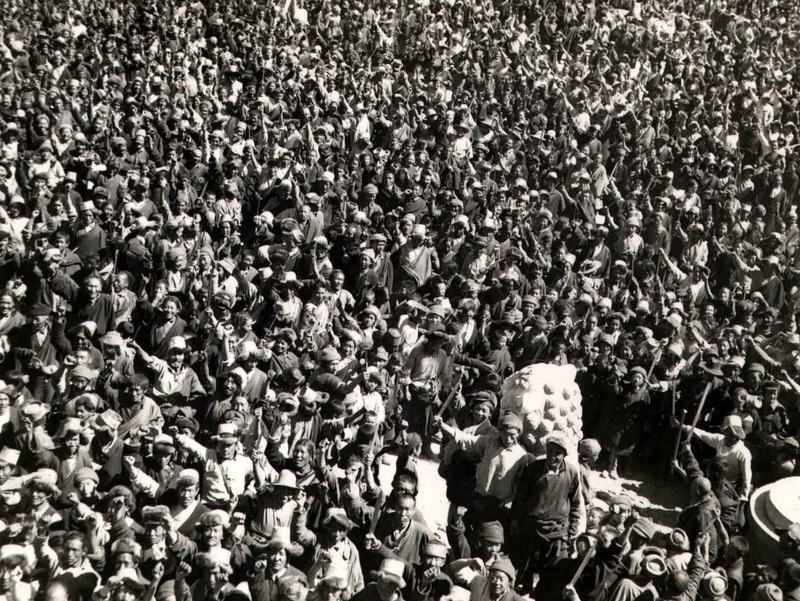 At the end of 1958, disorders and open revolts began in some Tibetan areas. With the help of foreign intelligence agencies, reactionary nationalists began to broaden their subversive work. In January-February 1959 a major revolt erupted in the region of Kham (eastern Tibet). The rebels cut the eastern highway into Tibet and established communication abroad, including with Jiang Jieshi’s troops in Burma. According to information held by the Chinese comrades, the Tibetans’ actions are inspired by the Americans and English. The Americans are sending help to the rebels through Pakistan and Burma. 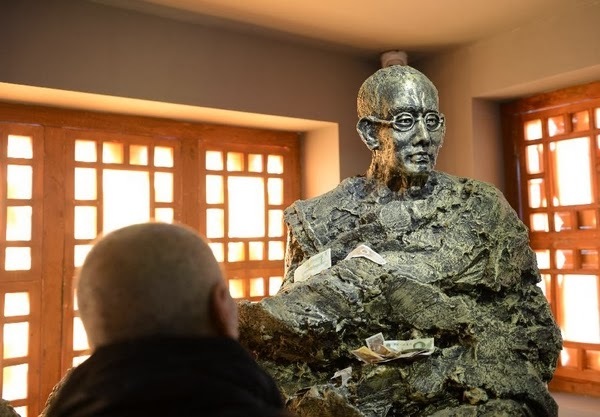 India, despite Nehru’s assurances of non-interference in Tibetan affairs, also according to the Chinese comrades’ information, has not stood aside. Help to Tibet, including cannons and machine guns, is coming from India via Nepal. The Indian consulate in Lhasa took a direct part in organizing the revolt. The uprising’s foreign center has been founded in the Indian city of Kalimpong. In this situation the Chinese friends took decisive measures to put down the uprising. 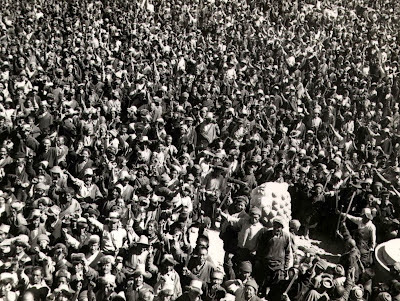 According to them, the revolt was crushed in Lhasa on 22 March. The Dalai Lama escaped from Lhasa and his whereabouts are still not known. In other parts of Tibet the uprising continues, but the Chinese friends are sure that they will soon re-establish order throughout Tibet. This is made easier, because the Panchen Lama, the above- mentioned Ngabo Ngawang Jigme, is on the PRC’s side. The friends intend to rally the workers of Tibet around him and other Tibetan progressive figures to carry out reforms, agricultural, first of all. The friends for political reasons intend to draw the Dalai Lama to their side again. From the Chinese friends’ communications, we can see that the uprising in Tibet has a national-religious tint. In the main, the central, eastern, and southern areas of Tibet are involved in the uprising. The main forces of the Tibetan counter-revolution are religious circles, who have drawn local Tibetan military units and one of the Tibetan mountain tribes, the Khampa, to their side. Spies from imperialist countries were the inspirers and, in large part, the organizers of the uprising. We can also assume that the majority of the population, especially laboring peasants stayed away from the action, supporting neither side. Here we clearly need to find the reasons in aspects of CCP policy in Tibet. First of all, it is necessary to note that eight years after liberation [by the PLA], Tibetan peasants remain in serf- like dependence, while in other minority regions, socialist transformations have already been carried through, with the party’s policy receiving broader social support there. In Tibet the mai effort was through peaceful solution of all problems by agreement with the feudal-theocratic circles and their “re-education”. In the main, the working masses saw few real results from living in a socialist state. The Chinese friends are aware that the wide publicity of the Tibetan events in the capitalist world may bring certain international complications for China. In their opinion, England and the US will try to use the Tibetan events for inimical propaganda against China to strengthen the “cold war,” possibly [including] putting the Tibet question in front of the UN. It is possible that the escaped rebels with the aid of the US and other imperialist states will create a Tibetan emigre government. This will become even more complicated, if the Dalai Lama is hiding abroad. As can be seen from the Chinese friends’ messages, they are especially concerned about PRC relations with India and the events in Tibet. Since Indian circles were mixed up in the Tibetan events, it will effect Chinese-Indian relations in some measure. Recently, the reactionary parties and groups in India are demanding a parliamentary discussion of the Tibetan events. The Indian Popular-Socialist Party is organizing anti-Chinese meetings and demonstrations. Many Indian newspapers have begun an anti-Chinese campaign. Religious circles in India also are trying to use the Tibetan events to aggravate relations between India and the PRC. The Chinese friends are more concerned about the international aspects of the disturbances in Tibet. Here, evidently, sooner or later they will have to make appropriate statements and take practical steps. My article A small step for India appeared in NitiCentral yesterday. The fact that the Union Minister for Information and Broadcasting, Manish Tiwari denied Rao’s allegation is irrelevant; India is indeed not doing too well in Research and Development (R&D) and technological innovations, mainly due the lack of serious interest (and funding) from the politicians … and the babus. The Minister mentioned Mangalyaan, the Mars mission and the Chandrayaan, the lunar which has been relatively successful; this however does not make India an innovative nation. These are just remarkable exceptions which confirm the rule. The Mangalayan program is a case in point; though limited in scope (due to the ‘low-cost’ funding), it will hopefully make India proud. ISRO has already successfully raised the orbit of the Mars Spacecraft 5 times since the Mars Orbiter was launched from Satish Dhawan Space Centre in Sriharikota on November 5 by the Polar Satellite Launch Vehicle (PSLV-C25). 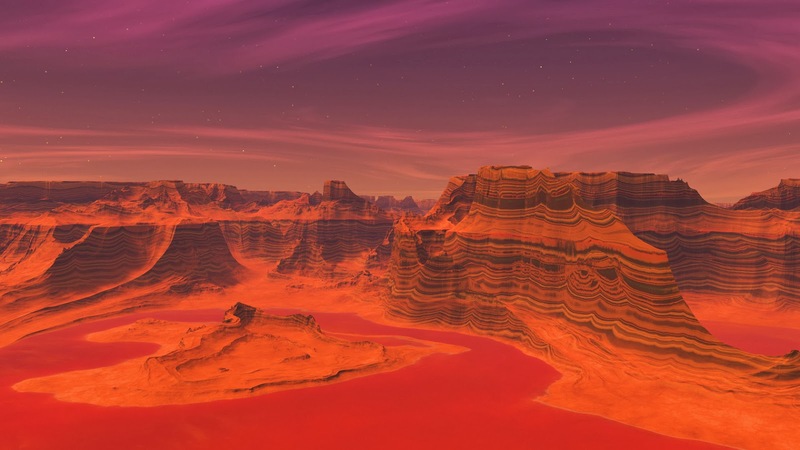 If everything goes well, the satellite should start orbiting Mars in September 2014, searching for methane and signs of minerals. A small step with a small budget! Jiao Weixin, a professor at the School of Earth and Space Sciences of Peking University is quoted by the same Global Times, saying: “With the mission launched within a very short period, India eyes the political influence hereby brought and intends to be the first one in Asia that orbits Mars." But China is still far ahead in terms of ‘innovation’, simply because Beijing’s leadership has the political will, while Delhi’s politicians do not. Even the recent Communist Party’s Third Plenum reiterated ‘the importance of innovation in terms of national defense and for the military’. Though not all the projects have a direct military implication, ultimately ALL the projects will help Chinese indigenous technology and for most of them, they will have a dual use (civilian and military). Amongst the most prominent Chinese innovations in the pipeline is a new jet engine that promises to deliver thrust equivalent to 15 times its own weight. The thrust-to-weight ratio is a key indicator to measure a jet engine's performance; today, the engine used in the sophisticated US' F-22 raptor fighter has a thrust-to-weight ratio of eight. Though China also has problems with its fossilized babus, the Communist Party’s will to innovate is much stronger than in India, simply because it is the shorter way to dominate the world. Can one day India catch up with China? Especially in the defence sector, India depends in a large measure on imports. The main reason is the lack of a large-scale R&D program. A few months ago, Dassault Aviation, the constructor of the Rafale selected in the MMRCA project, expressed some doubts about the capacity of Hindustan Aeronautics Ltd. (HAL) to absorb French technology; without even speaking about ‘innovations', the question today is, can HAL ‘digest’ French technology? Delhi needs to invest tremendous efforts in the domain of innovation if India is serious about catching up with China …and the West in this domain. Mangalayan is a small step in this direction. While India, like China, is suffering from bureaucratic deficiencies (politicians should be added in the Indian case), the leadership in Beijing has the political will and intelligence (and adequate economic means) to change this scenario in the years to come; it does not seem to be the case in India, at least under the current political equation. For example, today HAL’s design capabilities are very limited. Design engineers at the middle level are good with analytical ability, but the leaders are absent (perhaps because HAL is not ready to pay ‘the price’ to get them). Take the case of the Trainer Pilatus PC 7 selected for training after the HAL’s HPT 32 Deepak was discarded. The alternative proposal from HAL for the HTT 40 (Turbo-prop trainer) was also not considered as it was still at the initial design stage. The lack of good leadership in the Design Bureau is one major problem in DRDO as well as HAL. There is some truth in this, but today the top leadership knows that in order to materialize the Chinese Dream, China needs to innovate. The Indian Dream has unfortunately not even been formulated as yet. It is a pity, because the ingredients (brains) are very much present. The politicians’ brains need to be convinces; this is another story. My article China’s 2013 yin-yang: Reforms and Security appeared in the Edit Page of The Pioneer today. The new leadership in Beijing seems to have adapted the concept to political philosophy; after 4 days of discussions (from November 9 to 12), the Third Plenum of the 18th CPC Central Committee has, amongst other things, delivered 2 new Leading Groups: one on reforms (it was expected) and more surprisingly, a National Security Committee (NSC). 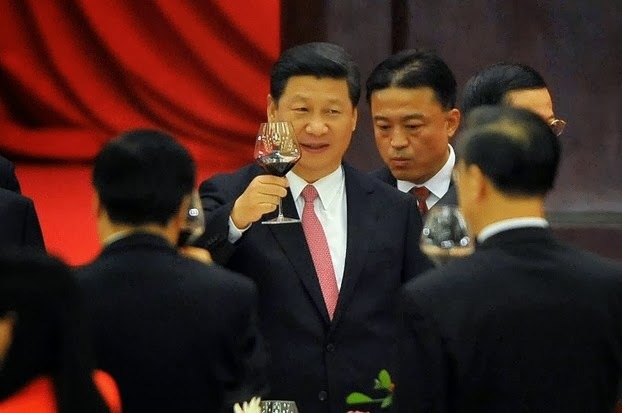 That is the ‘yang’, but for the ‘yin’, Xi Jinping and his colleagues believe that the doom of the former Soviet Union (where internal security apparatus had become weak, corrupt and ineffective) needs to be avoided at all cost. The present regime thinks that if effective reforms are not introduced, the days of the Communist Party are counted. They may be right. Referring to the Third Plenum of 1978 which saw Deng Xiaoping implementing large-scale economic reforms, the Party said that the then ‘reform and opening-up’ led the CPC into a ‘new era’, adding that the present reforms would decide the destiny of modern China. Amongst the sectors to be reformed, the Plenum mentioned building a more impartial and sustainable social security system; encompassing an improved housing guarantee; strengthening the protection of intellectual property rights; encouraging innovation, etc. The 204-member Central Committee has further decided to allow more non-state-owned capital into the market to develop a ‘mixed-ownership economy’; to accelerate the reform of the ‘hukou’ system (household registration) in order to help farmers become urban residents and to promote market-oriented reform in state-owned enterprises by breaking monopolies and introducing competition. An immense programme! The Chinese ‘masses’ will particularly welcome the loosening of the one-child population policy, which will allow in some cases couples to have two children. Though the decision to move forward is certainly a positive step, the implementation of the reforms won’t be easy. Another welcome decision is that economic growth regardless of environment will not be permitted in regions located in ecologically fragile areas. Does it mean that China will drop its plan to divert the Yarlung Tsangpo (Brahmaputra) or other rivers originating from ‘fragile’ Tibet? Let us hope that common sense will prevail and the nefarious plans will be shelved. A measure to be watched is the abolishing the infamous ‘reeducation through labor’ system. But what will replace it, already question many Western Human rights organizations? Beijing has also announced that it will ‘step by step’ reduce the number of crimes subject to death penalty. Once again, it is easier said than done. But there is a more important side (yin?) to the ‘yang’ coin, the ‘stability’ factor. According to Beijing all these new open-policies are possible only if China is stable: "State security and social stability are preconditions for reform and development", said Xi adding that only when the nation is safe and society is stable, could reform and development constantly advance. ‘Internal’ security has traditionally meant muzzling the opposition to the regime. It will continue to be the case. While actively popularizing the Internet, the Plenum decided to ‘reinforce its overall administration over cyberspace in accordance with the law and accelerate formation of a sound Internet management system”. It is quite ominous. Though analysts believe that the NSC is based on the National Security Council of the United States, it will have snooping facilities like the US notorious National Security Agency. Reuters says that the NSC “would increase coordination among the various wings of China's security bureaucracy, split now among the police, military, intelligence and diplomatic services”. Tibet and Xinjiang are two of the ‘internal’ threats which will be dealt by the new body. Recently, the repression has increased in both restive regions with the State tightly monitoring the lives of the Tibetans and the Uyghurs. The self-immolations in Tibet have been the most visible consequence of the stiffening of the security apparatus. Will the new Emperor ‘reform’ the Middle Kingdom? We shall have to wait a few years to know. In the meantime Delhi should definitely be alert as the NSC will also be responsible for the Sino-Indian border issue. The ‘lack of coordination’ during the Depsang Plain incident in Ladakh in April is probably one of the many reasons which led to having a NSC. Delhi should also take a few pages from China’s reforms program, but presently the government is too busy distributing Bharat Ratnas. Chinese are good at rewriting history. The latest example is the new Museum in memory of the great Amdo scholar, Gedun Choepel, which opened last week in Lhasa. Three months ago, I wrote on the same subject arguing that China was ideologically confused, but, as can be seen from the article reproduced below, it seems today more pure history rewriting than confusion. Many facets of Gedun's life have been deleted and re-scripted by the Party's historians. For example, it is said that during the last years of his life, Gedun used to often visit the Jokhang cathedral and stay for long periods in the chapel dedicated to King Songtsen Gompo. He greatly admired the 33th King for having unified the Tibetan nation and pushed back Tibet's borders towards the Middle Kingdom's frontiers. Some of his disciples recalled that Gedun was then 'like in presence of a spirit' (the spirit of the King?). 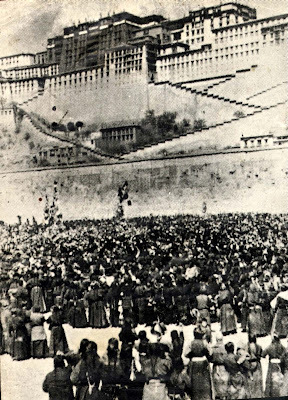 He also liked to watch the Tibetan Army's drills in Lhasa, though he bitterly complained that the training unnecessarily followed the British style with the orders given in English and the marching style, the uniforms and even the band copying the British pattern. Gedun however enjoyed watching the Tibetan Army; he knew how important it was for Tibet to remain independent. Of course, the Communist Party has today forgotten this aspect of the life of the great scholar and artist. One day, he told a disciple: "We have to fight to retake all the territories which once belonged to Tibet. For example, Tsaidam in the North, the name is Tibetan and means 'saline swamps'. Also Chone, Gayrong and Muli in Yunnan, all these areas are truly Tibetan territories, he explained, adding that "though for thousand years the Dharma has impregnated the Tibetan Spirit, what can be done now?" 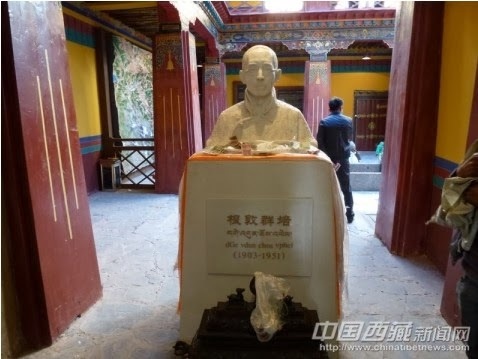 Jokingly, he suggested to transfer the statue of Jowo from Lhasa to a place equidistant from Central Tibet, Kham and Amdo; it would help reunify Tibet, through the power of the Dharma. Then he added, 'we would have to fight to destroy the religion'. He was probably referring to the excess of power of the Great Monasteries around Lhasa and the close connection between land ownership and these monastic institutions. The Chinese memory is very selective. Gedun Choepel would have be the first to fight for a free Tibet, free from all superstitions and old beliefs, free from injustices, but also free from the Chinese Communist Party. One more detail: Gedun did not die on August 15, 1951 as stated in the article below. He witnessed the Chinese troops entering Lhasa on September 9, 1951; he is reported to have shouted: "All is accomplished". He believed that Tibet had started to pay for its 'karma'. While watching the PLA from the rooftop of his apartment on the Barkor, he knew that it was the end of a world. He would described himself as ‘a priceless lapis lazuli vase dashed against a stone.' His dreams for a modern democratic Tibet were broken. The next month Gendun Chopel developed a severe edema, (as a result of cirrhosis of the liver?). He passed away on the eleventh day of the eighth month (October 1951). 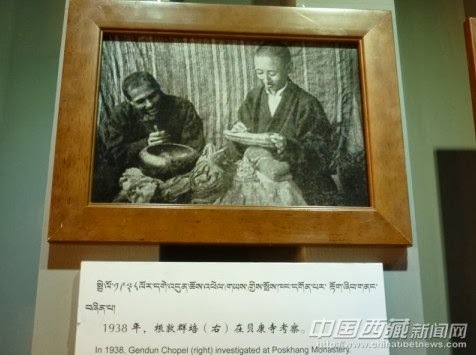 A museum in commemoration of Gedun Chophel, a Tibetan humanism pioneer and scholar, was opened to public in Lhasa, Nov. 11, 2013, according to Chinatibetnews.com. 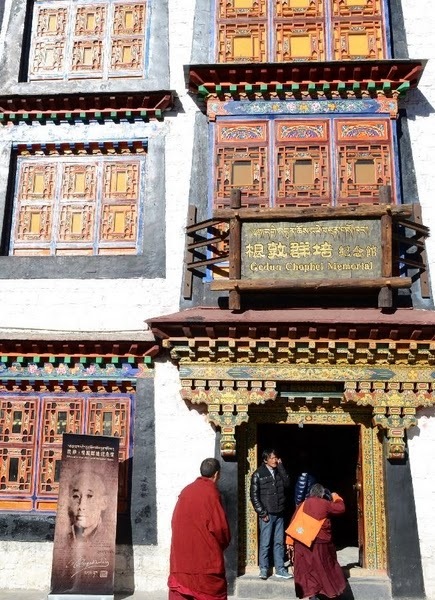 With a strong Tibetan flavor, the Gedun Chophel Museum is part of the Lhasa old town's protection project, covering an area of 1,269 square meters and consisting of three stories. The exhibits are divided into four parts, including the Gedun Chophel’s 24 years in Amdo, seven years in Lhasa, 12 years in South Asia and the last few years of his life back in Lhasa. Gedun Chophel was born on April 20, 1903, in the Zho Phung She Village Tongren County, Huangnan Tibetan Autonomous Prefecture, Qinghai Province. He believed in the Nyingma Sect of Tibetan Buddhism. In Gedun Chophel’s age, China experienced a turbulent period of domestic strife and foreign aggressions. He pursued truth, upheld humanist spirit, turned his conception of history from Buddhist theology to humanism, and made important contribution to Tibetan modern academic and intellectual history. While pursuing new thoughts and seeking for social changes, he severely disclosed and satirized various social problems of old Tibet and the British colonist’s plot to invade Tibet. 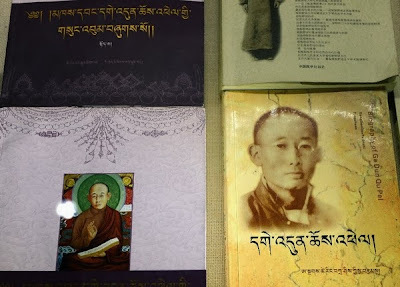 He participated in the survey and the catalog of the remains of the palm-leaf manuscripts in Tibet, the interpretation of ancient Tibetan literature in Dunhuang, the exploration of Tibetan philology, the English translation of Tibetan ancient books and other groundbreaking academic activities. He also wrote and translated a lot of books, and produced a great number of paintings. All these promoted the later development of Tibetology. When he returned to Tibet from India in 1945, he prepared to write a book titled The White Annals. However, in April, 1946, the then 'Gaxag' [Kashag] government, incited by the British government, put Gedun Chophel into jail, where he was kept in a gruesome prison and intermittently tortured. 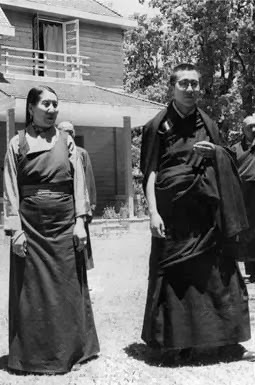 Shortly after his release, he died of physical weakness in the 'Kar ru shal' courtyard of Barkor Street of Lhasa on August 15, 1951, at the age of 48. Qi Tsala, [Choedrak] member of the standing committee of Tibet and municipal party secretary of Lhasa, visited the Gedun Chophel Museum together with representatives from related departments and local residents. After the opening ceremony, the Lhasa municipal government held a meeting on management of the Gedun Chophel Museum. The museum’s renovation has gained vigorous support from the local residents in Lhasa old town, who have got proper relocation; meanwhile, it has also won the support of relative departments such as the Center for Tibetan Studies, said Qi Tsala, who thanked the relative departments and workers for their hard work during the renovation and preparation for the opening ceremony. In its section Agenda, The Sunday Pioneer publishes The Last Frontier Post, a report of my visit to Menchuka in West Siang. Explorers always loved the ‘blank’ on maps. It is perhaps the hallmark of the human spirit to want to know what it does not yet know. Even for modern Google Earth explorers like me, ‘blanks’ are fascinating. It is perhaps what encouraged me to visit Menchuka, the remotest, large village before the McMahon Line dividing India and China, in West Siang district of Arunachal Pradesh. While researching for a book on the McMahon Line, I spent weeks exploring archival materials to understand this distant part of India, called the North East Frontier Agency (NEFA) by the British. I eventually found maps of most of the Frontier Divisions (Lohit, Siang, Subansiri and Kameng), but very little on the Siyom area. British explorers such as Capt Frederick Bailey and his colleague Capt Morshead surveyed the Himalayas ‘beyond the snow line’ (that is Tibet) to prepare the ground work for Sir Henry McMahon, the British Foreign Secretary, to draw his famed map, or later Francis Kingdon-Ward, the intrepid botanist and explorer who never visited the area or the nearby Manigong valley. It is strange because the passes from these two valleys are the easiest route to reach the Yarlung Tsangpo (which becomes the Siang after crossing the Indian border, and later the Brahmaputra in Assam). The road from Arunachal Pradesh’s capital Itanagar, which passes via Assam, was uneventful, thanks to a customary Assam bandh which left the road free of its usual traffic; it is only after Likabhali, the ‘checkpoint’, that one re-enters Arunachal; after showing the authorities an Inner Line Permit (or Protected Area Permit for foreigners), that the adventure really starts. Along (now written ‘Aalo’ by the local administration), the district headquarters, is located 130 km from the Assam-Arunachal border. 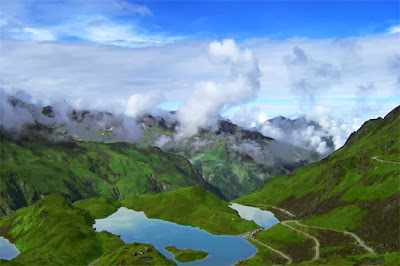 During the six-hour journey, one starts experiencing the luxuriant vegetation. Suddenly, I understood better why the British preferred to keep the area ‘unadministrated’ between an Inner Line (the interstate border) and an Outer Line (the McMahon Line after 1914). It was simply too costly for the Empire to run a normal colonial administration on this terrain. Only when circumstances forced them, the British ‘penetrated’ these impenetrable hills and imposed the Empire’s administrative system and ‘civilisation’ on the heterogeneous and often unruly tribes. The murder of Noel Williamson, the Assistant Political Officer at Sadiya, by an Abor tribe near Komsing village in East Siang district in 1911 was one such event. Meanwhile, one question had started bothering the British: Can China encroach in southern Tibet? This set the ball rolling and two years later the tripartite Simla Conference was convened which eventually resulted in fixing the India-Tibet border. To reach Menchuka from Aalo takes an entire-day’s drive on the road poorly maintained by the Border Road Organisation, an Army outfit. But what a day! The road follows the turbulent Siyom river, cutting its way through deep canyons to the lowlands where it meets the Siang. The landscape is magical with dense forests, flocks of white clouds hanging over the deafening river and the imposing waterfalls; crossing small villages with a few large houses constructed of bamboo and local materials and built on high pillars, makes the trip even more picturesque. The 180-km route to Menchuka is a treat in itself; during the nine-hour journey in a local Tata Sumo (the only car plying in the area), I never felt jaded for a minute. Having left Aalo early, I arrived in time in Menchuka (in Arunachal Pradesh the sun sets at 4.30 pm), to discover another world: A long plain with a large village built around the longest advanced landing ground of the State manned by the IAF, with houses looking like Icelandic cottages. As I was looking at the Menchuka plain surrounded by snow-peaks, my local hosts asked me: “Don’t you think it looks like Switzerland?” Perhaps, but it has a charm of its own. Though this remote administrative Circle of West Siang is located just 50 km from the LAC (McMahon Line), Menchuka has been opened to tourism a couple of years ago and a few days after my visit, a Menchuka Tourism Festival was inaugurated by the Chief Minister. There’s a controversy on what is the true name of the place — Menchuka or Menchuka? ‘Me’ means fire in Mempa, a Tibetan dialect; ‘Chu’ is water and ‘Ka’ is snow; as for Menchuka, it would mean the ‘land of the medicinal plant and river. Each visitor is left to decide the meaning. Tourism could be a great boon for the local population which remains deprived of modern facilities such as newspapers, Internet or even a petrol pump. One of the most surprising attractions for the visitor is the cave where Guru Nanak once meditated. After driving some 15 km towards the Tibet border (close to the end of the motorable road), I reach a bridge where we have to leave our vehicle. After a steep climb of a few hundred meters, I arrived at a small dwelling built around the cave where the first Sikh Guru stayed, probably on his way to Tibet. A few years ago, I had seen another cave, north of Tawang, where a Nanak Lama would have done some tapasya; here too it was probably Guru Nanak. In Menchuka, the Guru left marks of his turban in the rock; you can even see his sandals. Walking down perilous slippery stairs made of planks, to reach the tumultuous Si river, I am told to fish for a stone in a small cavity on the river bed. To bring out a white stone is extremely auspicious and indicates that the blesings of the Guru are upon you. I am lucky to get one. On the way back, I visit the old gompa (monastery). It is the oldest of the district and it belongs to the Nyingma tradition of Guru Padmasambhava. As the road to the Gompa is still under construction, to reach the top of the hill where the Gompa is perched is not an easy hike. But if you make it, the sight takes your breath away. The 360 degree panorama is most impressive. Not too far away is the snowline selected by McMahon and his Tibetan counterpart which today separates India and Tibet. I marvelled at the Si river meandering tumultuously in the valley; it will become the Siyom after joining the Yomi in Tato village, 50 km downstream. One historical aspect of Menchuka is always present: China occupied the area for a few weeks in November 1962. Some old people still remember the Chinese ‘visit’. I was told: “The Chinese soldiers were not aggressive; they just told us: ‘you are Chinese like us, we will never harm you; you don’t have long noses like the Indians, your eyes and skins are similar to ours’.” Today Beijing still calls the area ‘Southern Tibet’. One general regret in Arunachal Pradesh in general and Menchuka in particular is that the Union Government has done very little to develop the road network during the past 50 years. The road in the last 37 km between Menchuka and the border is still not motorable; the situation is worse in the neighbouring Manigong valley. One litany I heard during my stay in Menchuka is, “Why don’t we have proper roads to the border? Why can’t Delhi reopen the border like it did for Nathu-la in Sikkim?” I have no answers. Ironically, the Chinese recently announced the opening of a highway linking Metok with neighboring Bomi town, located not far away north of the McMahon Line. On the last day of my stay, I meet ‘the oldest man’ of the area; he is 101 years old. He was already a gaon burah (village headman) when the Chinese came in 1962. When I ask him about his most cherished dream, he says: “Tell the Prime Minister to reopen the border, I want to visit my relatives in Tibet and bring back yaks; the species has become extinct on this side of the border.” Is the Prime Minister listening? According to The China Daily, a delegation from Xinjiang's capital Urumqi visited Lhasa to learn the tricks about 'security' and 'stability'. The delegation was taken around by Tibet's Security Czar, Deng Xiaogang who is also the Party's Deputy Secretary of the Tibet Autonomous Region. You can be sure that the delegation had not come for sight-seeing. According to The China Daily, the Party cadres from Urumqi were very impressed by the "effective grid management system, which arranges every five or 10 households into a group. 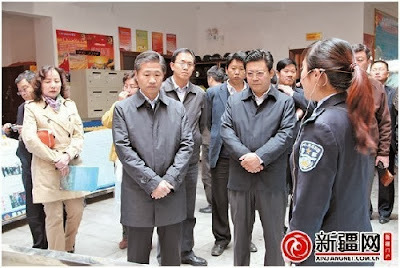 They concluded that the Urumqi government should put more effort into improving community facilities and service, enhancing the management of its floating population, and maintaining community stability." Will an 'effective' grid system be able to stop cars ramming into tourists on the Tiananmen Square? Not sure! 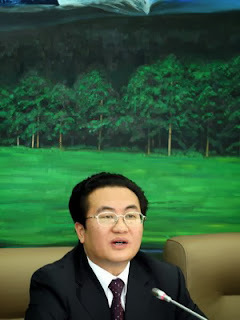 Anyway, the leadership from Xinjiang believes that it can learn from Tibet. In an earlier post, Tibet: nets in the sky and traps on the ground, I mentioned the Orwellian monitoring system put in place in Lhasa (probably by Deng Xiaogang). One understands that other provinces are interested. A delegation led by Zhu Hailun, Urumqi Party committee secretary, paid a first-time visit to the city of Lhasa in the Tibet autonomous region from Oct 26 to 27. The delegation discussed economic and livelihood development with local officials. The delegation – including Zhang Huaguo, Yuan Baoxin, Qiu Shuhua and other directors from the Urumqi government – visited a number of sites, such as the Potala Palace, Lhasa Train Station, Lhasa City Planning Exhibition Hall and Lhasa Lugu community. They were accompanied by Deng Xiaogang, deputy secretary of the Tibet autonomous region Party committee, and Zhang Yanqing, mayor of Lhasa. The delegation was impressed by Lugu community’s effective grid management system, which arranges every five or 10 households into a group. They concluded that the Urumqi government should put more effort into improving community facilities and service, enhancing the management of its floating population, and maintaining community stability. Zhu Hailun also shared experiences regarding promoting cultural tourism and building city brands with local officials. At the Lhasa Train Station, the staff explained the station’s architectural style, management system and eco-friendly technology to the delegation. Lhasa Train Station, founded in 2006, is a main part of the Qinghai-Tibet Railway project. It lies in Liuwu New Area, 1 kilometer to the south of the main river and 5 kilometers southwest of the Potala Palace. Lhasa is the administrative capital of Tibet. It is one of the highest cities in the world, located at an altitude of 3,490 meters. The city contains many culturally significant Tibetan Buddhist sites such as the Potala Palace, Jokhang temple and the Norbulingka palaces, many of which are located in Chengguan district.